Email can be time sucker, you check it up to 36 times an hour. You also tend to think email is important but many times it really isn’t. Emails like Facebook notifications, friends, Pintrest, Twitter, etc. Interesting no doubt, urgent maybe, but are they really important? Are they important like Stephen Covey’s urgent versus important? What you need to get done today – that’s important! So then change Outlook so that the startup folder doesn’t point to your Inbox, have it point to your Tasks folder instead. If you already know why you want to do this, there you go! If you, however, want to understand how to effectively configure and use the Tasks feature, read on. Let’s step back. Why are you there at the office? What is your role? What are your short and long term goals – both for yourself and for the company? To stay effective in your work or home environment you need to remind yourself what your priorities and tasks are. Yes, the Inbox is that default Outlook startup folder, it comes that way. Wouldn’t it be better though to start by reviewing your priorities and tasks first? Orienting your mind to the important things? How do you know if that email you are looking at is worth your time to respond, or should you push it to the side, or should you just delete it? If you fire up Outlook and it starts in the Inbox folder you’ll be tempted to jump right in, read, and start replying, then who knows how long it will be before you finally get back to what you really need to do. Making Tasks your Outlook startup folder will give you the right frame of mind, the right focus. With your tasks and priorities now in your mind you can then go and review your emails and decide if they are urgent, important, or junk. Why Use Outlook To Track your Priorities and Tasks? Okay, so you know you need to start your day reviewing your priorities and tasks. What’s the best way to do that? Outlook actually has quite a good Tasks tool once you commit to using it and have set it up in a way that works. The reason I think Outlook is a good tool for tasks and priorities is mainly because it is likely one of the main applications you use, both at home and at work. Outlook is on your computer, it’s on your smartphone, it’s on your tablet. Chances are you have it with you everywhere you go. Having something that you always have with you, and you know how to use, is a perfect tool for tracking because you can add, change, or delete wherever you might be. For many years I had a paper calendar and notepad for tasks and scheduling. Paper can get lost or damaged, and making edits means scratch out and write again. Plus you always have to have a pen or pencil available. You already carry a device or two with you everywhere you go; your laptop and your phone. Why also carry a calendar and notebook? No, use what you already have and know. Outlook Tasks can actually be a powerful organization tool and making Tasks your default Outlook folder will help. If you’re like many you may have never gone to the Tasks section of Outlook. The link is at the bottom left, the picture of the clipboard with the check mark in it. Click it now and chances are for you it brings up a blank page. Click the new tasks button, enter a subject and some text and save it. Your first Outlook task! – not too pretty and doesn’t say a lot, and imagine 50 tasks shown there. How would you keep track of them all? You need to change the view. Go back to your new tasks and enter a Start Date and a Due Date. 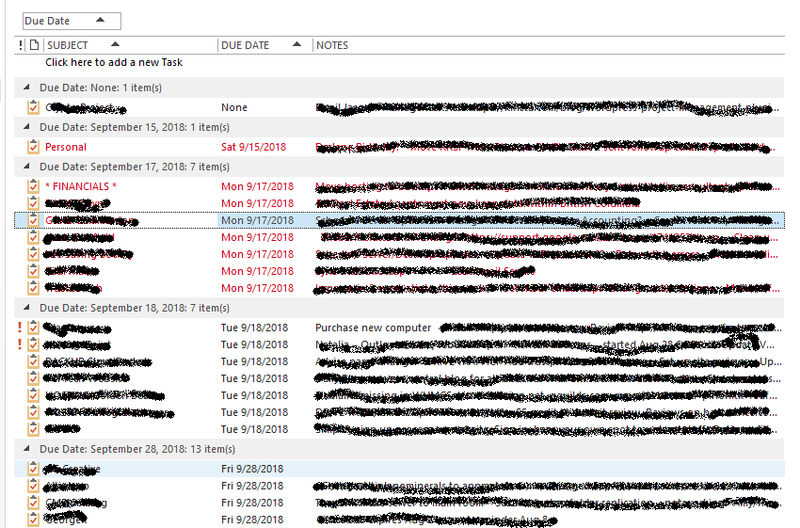 In order to make Outlook Tasks effective you need to sort your tasks so that they immediately tell you what’s important. Now you will see your tasks by Due Date. Under each date they will be prioritized with High Priority at the top, sorted alphabetically by Subject. I also removed some columns to keep it clean for viewing. (right-click and remove). High priority items show with an exclamation mark. Overdue tasks will show in red, and your next steps or notes will show on the right to give you a quick heads up of each tasks. On the left is the type of task. I use customer names or portions of the business, such as; “financials”, or “website”, or the name of the customer or client involved. I massage the column widths to give me the right view. To do this you can just click and drag the column edges. For me this works well, you may find a different way. Now that your Outlook startup folder is the Tasks view you will immediately see your list of tasks and objectives you need to accomplish today. You’ll see what’s overdue, and what’s coming up. If you review your tasks each morning and update the next steps and due dates you’ll now have a good tasks list, and you’ll know your priorities right up front! Refer to your tasks and update them repeatedly throughout the day. I use an Android App called Tasks & Notes to be able to see these tasks on my phone and update them. Stay focused! Know your priorities! Be the first to comment on "Change Outlook Startup Folder to Tasks"